Background: As lithium-ion polymer battery has high energy density and it is easy to be manufactured into different shapes, it arouses more interests of both technology and application recently. The quality of the lithium-ion polymer battery is essential to all the applications, and the detection of bubble defect in cell sheets is critical to the quality control of batteries. Recent patents on flaw detection in cell sheet are reviewed. Method: A novel application is developed to detect bubble defect in cell sheets of lithium-ion polymer battery by using extreme learning machine. The image processing methods and the selected features for bubble detection are detailed. Gaussian mixture model density estimation for extreme learning machine is developed to solve the problem of lack of enough flaw samples for classification learning. 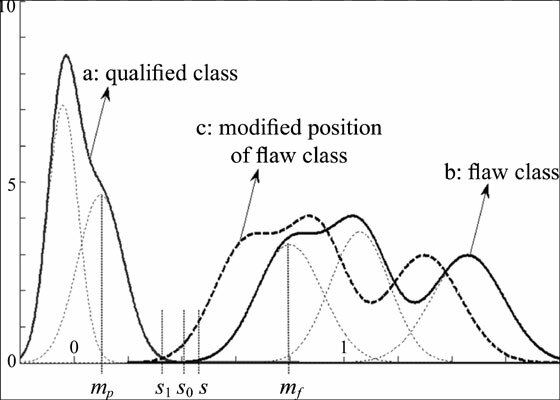 Results: The comparison of classification correction rate of different methods showed that the classification accuracy of the proposed method was between 99% and 100%. The proposed method was able to keep the superior performance of accuracy with the different sample numbers, and it had most satisfactory performance with varies of sample number. Experimental results also showed that the number of nodes in the hidden layer had little influence on the classification accuracy in the proposed method. Conclusion: All these experiments have shown that the proposed method has the best performance and the proposed bubble detection method is more efficient than other learning-based methods, and the proposed method has the potential to defect detection in other image processing applications. Bubble detection, defect detection, density estimation, extreme learning machine, gaussian mixture model, lithiumion polymer battery.